Over 140 international scholars from over 58 universities and 10 countries have studied Punjab, its history, geography, culture, political economy and religious traditions, in a unique programme that marks its 10th year now. Participants for the 10th annual Punjab Studies Programme with Prof Gurinder S. Mann at Baring Christian College, Batala. The Tribune and the Air-India RANK and BOLT Awards 2006-07 for students and teachers have been announced and the following is the ranking of individuals from Chandigarh, Punjab and Haryana. Evaluation should be an enabling fact and not an impediment. It should be so devised to make a pupil learn a subject and not merely judge his learning skill, academicians of National Council of Education Research Training (NCERT), while interacting with the teachers of English across the nation, asserted. The University of California Summer Programme in Punjab Studies also teaches these students Punjabi, both at beginners and advanced level. Eminent scholars and experts present lectures and workshops to students during the six weeks that the programme runs here every year. Asked about the attributes and attractions of the programme, Prof Mann says it provides scholars from North America and Europe with an important forum for interacting with Punjab-based scholars and experts. Rather then just reading about different communities and religious institutions of Punjab in textbooks, students, during their carefully organised travel tours, are actually able to see and experience Punjab’s living traditions and visit holy places. “It remains the only programme of its kind to promote Punjab studies in India or overseas,” he adds. What has the programme achieved? It has built and nurtured a scholarly community whose research activity have a strong Punjab focus, the impact of which will last for at least the next generation, says Prof Mann. Several graduates of this programme have completed their PhDs and now occupy faculty positions in major universities across North America and Europe. The Sikh and Punjab Studies programme at UCSB has emerged as the largest doctoral programme anywhere in the world. 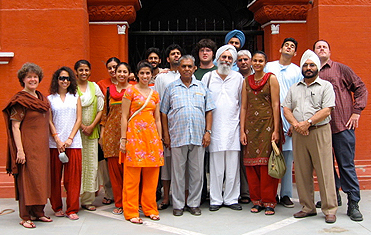 The Centre for Sikh and Punjab Studies at UCSB, established by Prof Mann remains the only university-based centre of its kind outside India. Journal of Punjab Studies, a diaspora-based multi-disciplinary magazine promoting scholarship on Punjab and Punjabis living overseas, is being sponsored by the centre. Its special issues provide important reference material on geography, culture and literature of Punjab. To teach Punjabi to foreign students, new teaching and learning material has been developed. A textbook on Punjabi language learning is almost complete; there is a large repository of audio-visual and textual material, says Prof Mann, full of plans for the future. Judging has now been concluded in all states and UTs, and the organisers will soon intimate to state award winners the venue where the national award selections will take place. RANK Awards: Ruchi Sharma (state winner); Sana Arora (state runners-up); Aarshpreet Kaur (state runners-up). BOLT Awards: Dr Arun Kumar Sharma (state winner); Dr Laxmi Narayan Sharma (state runners-up); Amit Kumar Bhattacharya (district winner); Pawan Walia (district runners-up). RANK Awards: Akihil Razdan (state winner); Navindderjeet Singh Bawa (state runners-up); Rupinder Singh Dhiman (runners-up from Bathinda); Paramdeep Singh (runners-up from Faridkot); Akihil Razdan (winner from Jalandhar); S. Jaideep Singh Makkar (runners-up from Jalandhar); Jaswant Singh Rautela (winner from Ludhiana); Navneet Kaur (runners-up from Ludhiana); Navindderjeet Singh Bawa (winner from Patiala). BOLT Awards: Chanderkanta Silhi (state winner); Dr Harmesh Lal Mittal (runners-up from Faridkot); Chanderkanta Silhi (district winner from Hoshiarpur); Satish Silhi Uppal runners-up from Hoshiarpur; Prof R. K. Garg (runners-up from Jalandhar). RANK Awards: Raj Naryan Panghal (district winner from Bhiwani); Urvashi Chauhan (district winner from Kurkshetra); Ashish Chauhan (runners-up from Kurkshetra); Aaditi Sinha (district winner from Rewari); Aditya Sinha (runners-up from Rewari); Sonia Rana (runners-up from Sonipat). BOLT Awards: Dr Sharad Bala Khare (state winner); Dr Rishi Pal Chauhan (state runners-up); Reena Panghal (district runners-up from Bhiwani); Prof Satya Vir Arya (runners-up from Hisar); Dr Rishi Pal Chauhan (district winner from Kurukshetra); Dr Sharad Bala Khare (district winner from Rewari); Dr Ram Tikaya Arora (runners-up from Rohtak). Reacting to queries put across by teachers during a technical training session of Edusat Interactive Network organized by the Central Institute of Education Technology, NCERT, in collaboration with Indian Space Research Organisation, the experts emphasised that teaching of English should stress on learning. The training was being imparted to make teachers aware of the changed syllabus of classes VI and IX. Technical sessions like these are being organised across 30 centres in the country. Teachers from various Kendriya Vidyalayas, JNVs and Army Public Schools had converged at the State Council of Education Research and Training (SCERT), Solan, to attend such sessions. The experts also pondered over the idea that evaluation should not be linked with achievement. Experts, while discussing a proposal to promote “open book learning”, said emphasis should be laid on problem solving aptitude and application. Teachers from the JNVs put across a typical query regarding the situation where the students reaching class VI could not cope with the subject. “The fact that they came from the state-run government schools and had not received basic five-year English learning, it was really difficult for them to pick up the subject all of a sudden, since the class VI course was devised for students having studied at least five years of basic English. Being first-generation learners and hailing from rural background, most of the students perform rather poorely, ” pointed out Ms Jyoti Sharma, a JNV teacher from Bilaspur. Though English had been introduced as a subject from class I in government schools in Himachal Pradesh, in Punjab and Haryana, it was introduced as late as class V. “With no English speaking background, the students could only learn this foreign language while in school. This further acted as a deterrent for students to gain confidence in using the language,” pointed out Suresh Modgil, a KV teacher from Naduan in Himachal. With sudden transition to a higher level in class VI, English further becomes a burden for a student. “A bridge course designed for the below average students should be introduced. At least a month should be set aside for such courses. Even the teachers should be imparted a month’s training every year to upgrade their skills. The summer vacations can be used for this purpose,” opined Ms Darshana Attri from KV, Gurdaspur. “Since lower proficiency in a class had a bearing on the increments, the teachers are forced to adopt an examination-oriented approach, while transgressing from the much-required knowledge-based approach,” pointed out Mr Ravi Sharma, teacher in Army Public School, Dagshai. The delayed availability of books each time a syllabus is changed was also rued as constraining progressive learning of the language. Cut red tape, says VC: Dr Jai Rup Singh, Vice-Chancellor of Guru Nanak Dev University, interacted with the every class of employees and teachers soon after taking over and urged all to use technology to raise the quality of university administration. The VC said employees were an important part of the university and they should evolve such a system that ensured quick disposal of files by overcoming the hindrances. Dr Jai Rup Singh said heads of various departments, instead of repeating the proposed note sent by the HoDs, should cite rules to get the file through in a minimum possible time by avoiding repetition. He said his agenda was to uplift the academic standard of the university. The university would provide students with education of global standards so that they are able to meet the international challenges. New Deans appointed: Dr T.D. Narang, a senior most professor of mathematics, has taken over as Dean, Academic Affairs, while Professor Sarup Singh, Head of the Guru Ram Das School of Planning, assumed the charge of Dean, Students Welfare of Guru Nanak Dev University (GNDU). Dr Narang (58), a Ph.D. from Delhi University, has more than 35 years of teaching and research experience. He has more than 113 research publications to his credit and also has so far supervised two Ph.Ds. and 15 M. Phil. dissertations. Vijay Rattan awardee Dr Narang had been nominated for the International Peace Prize and the World Medal of Honour by the United Cultural Convention of USA and the American Biographical Institute, North Carolina, USA, respectively. He was also appointed Advisor to the Director-General of International Biographical Centre (IBC), Cambridge (UK). Similarly, Dr Sarup Singh (59), one of the senior professors of the university, has a long teaching, research and administrative experience of more than 32 years. He has published two books, 60 technical papers and supervised 80 postgraduate theses in Town and Country Planning. Prof. Sarup Singh is the life member of INTACH, Fellow Member of the Institute of Town Planning of India and life member of the Punjab Geographers Association. DoB: 02 February ’82 - 01 February ’86. Height: 157 cms, Eyesight: 6/60, 6/60 corrected to 6/6, 6/12 with glasses. No colour / night blindness. Selection: SSB Interview & Medical Exam. Application Form: Send in prescribed format to the above address. Superscribe "Education Branch— Feb ’07 Course, Education Qualification: (as applicable), Aggregate %:____" on envelope. Eligibility: BTech or MSc in relevant subject with 50% marks. GATE qualifiers preferred. Application Form: Send Rs 500/- by DD favouring "Registrar, KU, Kurukshetra," payable at Kurukshetra for Prospectus (Code No MTech - 06) to the Manager (P&P) at the above address / download from website. Eligibility: Bachelor’s degree (50%) / Masters degree. Selection: BIM Aptitude Test (CAT / XAT score holders exempted), GD & Interview. Application Form: Download from website. Selection: CAT 2006 scores, GD / Personal Interview. Application Form: Send Rs 1275/- by DD favouring "FORE School of Management," payable at New Delhi with two self addressed slips to the above address or download from website. Application: Send Rs 1,600/- by DD favouring "Institute of Management Technology," payable at Ghaziabad with two self-addressed stickers to the Chairman (Admissions) at the above address or download from website. Selection: CAT 2006, GD, Extempore, Interview. Application Form: Send Rs 1325/- by DD favouring "Lal Bahadur Shastri Institute of Management," payable at New Delhi to the above address / download from website. Eligibility: For 1: Bachelors degree (50%). Selection: CAT-2006 scores, Interview. For 1: Aptitude Test in Maths, GD, relevant work experience, scholastic achievement. For 2: PGDM / PGDCM (from IIM); CGPA: 6/9 Or PGDBM (from IIM Calcutta); CGPA: 6.5/9 exempted from CAT. Eligibility: Bachelors degree (BSc / BE / BTech / Agriculture / Agricultural Engg / Veterinary Science / Home Science / BCom / BBA / Mgmt / Computer Application, 60%) or OCPA of 6.00/10. Selection: CAT 2006, GD & Interview: 1 March ‘07. Application Forms: Download from website. Selection: CAT 2006 & Interview. Eligibility: For 1: PhD / MD / MSc plus 2-3 years of research experience. For 3: Laboratory / Technical Personnel from Institutions with EM work experience Or EM training from AIIMS. Application Form: Send in prescribed format with attested passport size photograph to the Officer-in-charge, Electron Microscopy Facility, Department of Anatomy at the above address. Details: Employment News (12-18 August 2006). Application Form: Send Rs 550/- by DD (valid upto September 2006) favouring "Sale of Prospectus Form for AIIMS-PG Jan, 2007 Session, Current Account No 01000066590" payable at SBI, Ansari Nagar Branch (Code No 1536), New Delhi to the Assistant Controller of Examination at the above address by 10 September 2006 with your address and PIN code. Superscribe "Request for Application Form for AIIMS - PG / Post Doctoral Courses, January 2007 Session" on envelope. 2 awards of Rs 1 lakh plus medallion in individual category & trophy in Institutional category plus citation. Eligibility: Students in 2nd year Degree Course in Engineering (Electrical / Instrumentation / Mechanical / Electronics / Telecommunication / Computer Science). Candidates must clear first year in first attempt. Application Form: Send in prescribed format to Shri A N Verma, Dy Gen Manager (HR-Wel) with required documents through Head of your Institution to the above address. Details: Employment News (12-18 August 2006) / Website. Selection: CAT-2006 scores, GD & Interview. Application Form: Send Rs 750/- by DD favouring "IITTM,s" payable at Gwalior at the above address / download from website.